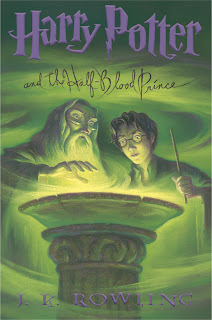 I'm on #6 on the Rereading Express, Harry Potter and the Half-Blood Prince. This time through I particularly like numbers 3 (Prisoner of Azkaban) and 5 (Order of the Phoenix). Azkaban is wonderfully layered, with lots of character development and interest. Phoenix is one heck of a complex book, with all kinds of stories and details eddying around. I find myself looking for clues: why is this character here and is he or she coming back? Kreacher, for example. Fleur de la Cour from 4 (Goblet of Fire) is back in 6 (Prince). How tightly will Rowling finally weave it all together? We have a betting pool in the family. I have bet that Harry lives, which I wasn't as sure of until I re-read. If he dies, Voldemort lives, right? Whose will be the sacrifice, since Rowling has hinted there is/will be one? Is it Dumbledore's? That makes the two dead major characters we have been told to expect. So why isn't the Bible as interesting as this? Same theme: good and evil.